The addition of Cinépolis Luxury Cinemas-Victory Park is a part of a district redevelopment led by retail partner Trademark Property Co. and owner UST XVI Victory Park, a German real estate investment fund, managed by Estein USA. Victory Park is undergoing a full remerchandising, adding 85,000 square feet of new retail space for a total of 220,000 square feet, and making key enhancements to evolve the district into a more energetic, walkable and soulful urban neighborhood. The second cinema house set to open in Texas as part of the brand’s aggressive growth plan, Cinépolis Luxury Cinemas-Victory Park adds to Cinépolis USA’s luxury movie theater category. Its opening follows the brand’s entry into Texas with premium theater concept Cinépolis Euless in August 2017. Currently, there are 18 theaters in the U.S., located in Texas, Southern California, Florida, New Jersey, Connecticut, Ohio and New York, with three openings this year and 10 new theater openings and acquisitions projected through 2020, representing a 55 percent increase in Cinépolis USA’s portfolio of luxury and premium cinemas. In 2017, Cinépolis reported 338.4 million attendees to its theaters worldwide. Cinépolis Luxury Cinemas-Victory Park, located at 2365 Victory Park Lane, Dallas, Texas, will screen movies seven days a week with ticket prices ranging from $10-18 for adults, and $8-14 for children. Taxes and special format charges may apply. Guests will be able to reserve seating via www.cinepolisusa.com upon the theater’s opening. For employment inquiries, contact jobs@cinepolis.com. 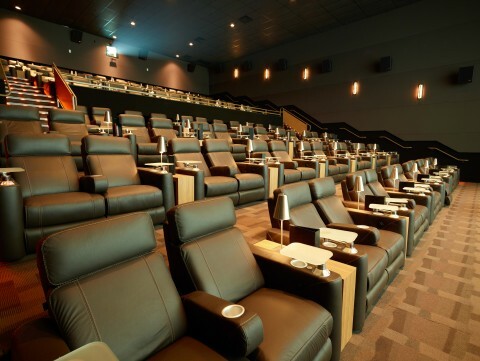 Cinépolis USA is a leading world-class cinema exhibitor that offers guests enhanced movie-going experiences through its “Cinépolis Luxury Cinemas” and “Cinépolis” theater concepts, and newly debuted 4DX and kid-approved Cinépolis Junior auditoriums. The Dallas-based theater chain opened its first theater in Del Mar, CA in July 2011 and has some of the top performing theaters in the country, currently operating a total of 18 luxury and premium theaters with a presence in Southern California, Florida, New York, New Jersey, Connecticut, Texas and Ohio. Additional theaters across the U.S. are planned to open in the next few years. Its México-based parent company, Cinépolis, is the fourth largest movie theater exhibitor in the world. For more information about Cinépolis USA, please visit www.cinepolisusa.com, or follow on Facebook at www.facebook.com/CinepolisUSA, Instagram at @CinepolisUSA or Twitter at www.twitter.com/CinepolisUSA. Cinépolis was founded in Mexico in the city of Morelia, Michoacán in 1971. Today it has positioned itself as the world’s 4th largest movie theater circuit, operating 665 cinema complexes, 5,313 screens and over 1,133,820 seats across 14 countries worldwide. It was the first cinema exhibitor in the world to pioneer the concept of luxury movie theaters, establishing the first luxury theater experience in 1999 in Mexico City. Cinépolis aspires to provide its guests with the best overall experience in film entertainment and employs a global workforce of more than 39,600 people to support its mission. Cinépolis plans to continue to revolutionize the industry for years to come. Victory Park is a 75-acre mixed-use development in downtown Dallas surrounding the American Airlines Center, home of the Dallas Mavericks and Dallas Stars. Victory Park features more than 220,000 square feet of retail, restaurant and entertainment space; 621,000 square feet of Class-A office space; the 252-room W Dallas – Victory Hotel; more than 3,300 residential units; and the Perot Museum of Nature & Science. Victory Station provides access to DART Light Rail and the Trinity Railway Express. The popular 3.5-mile jogging and bicycle path, The Katy Trail, is also directly accessible. Victory Park is a property of UST XVI Victory Park, a German real estate investment fund managed by affiliates of Estein USA based in Orlando, Florida. UST XVI became an equity owner of Victory Park in 2005 and the sole owner of the majority of the Victory Park buildings in 2009. For more information about Victory Park visit victorypark.com or follow Victory Park on Twitter @VPDallas, www.facebook.com/dallasvictorypark and Instagram @DallasVictoryPark.